What Do You Say to the People Who’ve Left? This passage of scripture captures two of the most beloved images of Jesus. The image of Jesus the good shepherd is so comforting. So is the picture of Jesus welcoming children and our heavenly Father protecting the “little ones.” Together, they give us a sense that Jesus holds and protects the most vulnerable. We know Jesus values those whom others see as ‘not really counting,’ the ones who are almost invisible. In the kingdom of heaven, everyone counts. Jesus isn’t doing a cost-benefit analysis of whether leaving the 99 is worth it to go get the one who strayed away. Every single one is precious in his sight. If we wander away, Jesus will come to find us. He will make sure we’re safe. He just wants us back. It’s a beautiful image of Christ. Really it is. But how does that translate to our world? What does that actually look like? How does Jesus seek out the lost? It’s a question close to every minister’s heart; a question every church has to wrestle with. What do you do when members of the flock have wandered off? It happens with great frequency. You notice that people who were once very active are coming to church less and less often… Folks who joined the church with great enthusiasm simply stop coming… Someone drops out of choir or goes off session and you hardly ever see them anymore. How much do you pursue them? When do you reach out? What are you supposed to say? And how much time should you spend trying to track them down when there are 99 more people who need your time and energy? But one of the things I’ve learned over time is that it shouldn’t be the pastor’s job. In fact it works best when it isn’t. The truth is, having a fellow church-member talk to a friend is 100 times more effective than a pastor – or anyone who works for the church. As humbling as it is to say, the reality is that your saying something has a lot more impact than if I do. After all, I’m paid to do this, right? You’re a friend who cares. I know, I know, we’re supposed to be the shepherds, right? After all, the word “pastor” comes from the Latin word for shepherd. The story doesn’t say the 99 sheep should go on a hunt for the 1. You guys should be off the hook. But in this story, Jesus is talking to the disciples, not ordained clergy. There weren’t any “pastors” in Jesus’ day. There were just disciples. And every disciple was a shepherd. It’s the disciples’ job to leave the 99 and go after the 1… So if you’re a disciple of Jesus Christ, guess what? Get your shepherd’s crook out. You’ve got work to do. We’ll be part of it, too, of course. But like I said, honestly, you can do this a lot more effectively than we can. But how are you supposed to go after the wandering sheep? What do you do? What are you supposed to say to a friend who’s wandered off? Sometimes it’s easier just to pretend nothing’s changed. You just say ‘hi’ and let it go. But you know what? That hurts, too. People slip away, nobody says anything, and they’re left to wonder whether anybody really cared. It hurts. That hurts. It hurts a lot. People leave for a whole host of reasons, and it’s hard to know what to say. So I’ve asked a couple of people to help us get a handle on this. Brad Hyslop is the chair of Membership Ministries and Doris Porter is our staff member for Congregational Life. Both of them were game to do some role-playing to help us out. Mind you, these are not their words, so don’t blame them if you think this is lame! I’m going to introduce a few scenarios about why people might wander off, and what a friend might say… It’s not one-size fits all, of course. Every person’s situation is different. But there are different sorts of reasons that frequently come up. Say you run into someone at the IGA and you haven’t seen them at church lately. Where do you start? Inviting to something very specific, and following up on it. Sometimes people leave because they feel like they’ve been neglected. Maybe they went through a rough patch in their lives and no one came, or called, or seemed to care. Your call may be the first time someone reached out. Maybe the hardest is when something has happened to make someone angry. I’ve said something from the pulpit that hit a nerve, or something felt too political. 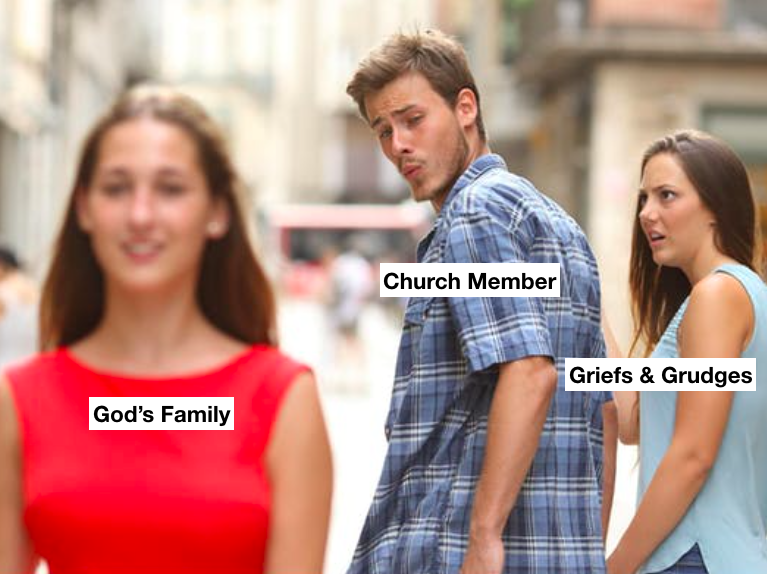 These are the things that can make someone feel like they’re not welcome, and even more, like the church has failed to be what they believe the church should be. However you open the conversation with the person who left, the conversation you have depends on what’s been so hurtful. I go back to #emptythepews, where people shared their reasons for leaving. Some had to do with how judgmental they felt their church was, whether about gays or other religions. Some people left to protest the overt bigotry and intolerance and sexism in their churches. Given the timing – right after Charlottesville - many of the posts were in response to the silence of their churches about racism. You know as well as I do that some terrible things have been done in the name of God. The white supremacists were carrying quotations from scripture. Do you see the common thread in all these scenarios? When we talk with people who’ve left there’s an attitude we bring, a way of being that makes a difference. Most of all, it’s loving. You come to them with love. This is the really important part: of course you want them to come back, but there are no expectations that they will. It’s not a ‘win’ if they come back; they are free agents. It’s a ‘win’ that you’ve had the courage to have the conversation. No expectations, but love. See, most of us have been those lost sheep at one time or another. We’ve gotten busy, or hurt, or burned out on church. We’ve needed someone to come find us. And thank God they have. Thank God for the ones who have had the courage to reach out to us.